A two year partnership bet ween Belfast International Airport and Action Mental Health has concluded with over £16,000 raised to help increase awareness of mental ill-health in Northern Ireland. Funds collected during the charity partnership, the first of its kind for Belfast International, will go towards helping people recover from mental illness in Northern Ireland and raise awareness of the symptoms. “We are extremely proud to have been selected as the very first charity partner of Belfast International Airport and are delighted with its unprecedented success. During the two year partnership, Belfast International Airport employees collectively organised a series of fun-filled fundraisers for both customers and staff, including a VIP discounted Christmas shopping event, coffee mornings, and pilates taster sessions. 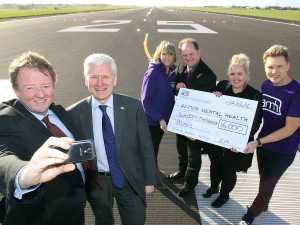 In addition, Belfast International Airport kicked of the partnership with a substantial donation of £10,000. “It’s hugely encouraging to know that such a prominent organisation such as Belfast International Airport has led the way in terms of raising awareness of mental ill-health both inside and outside of the workplace. Action Mental Health operates in nine locations across Northern Ireland and supports more than 2,000 clients each year by delivering a variety of life-changing courses to the local community. Programmes are specifically designed to assist individuals with mental ill-health in the recovery process by encouraging them to adopt a healthier lifestyle and widen their social networks. AMH also provide clients with the skills to build a better future, set personal goals, develop coping skills, re-engage with society and become more employable. “Belfast International Airport is extremely passionate about giving back to the local community, which is why we have a number of charitable initiatives in place to help fund a catalogue of worthy causes such as Action Mental Health.